* Would hanging that basket or lantern be that final touch? Brighten up your outdoor spaces with the strength and ease of this large, sleek, bracket-style hook. Carefully designed and tested by us, the UB-1066 provides the strength and support that your outdoor pieces are looking for. ✔ High Strength, High Quality Screws. ✔ Crossed Back Plate for Easy Installation and Adjustments. ✔ Powder-Coated, Corrosion-Resistant, Forged Iron. ✔ Perfect for almost any location. ✔ Careful representation of hook size reflected in images at top of page. All products from UpBlend Outdoors are backed with a NO EXCEPTION - 100% SATISFACTION GUARANTEE. Click "Add To Cart" and UpBlend YOUR Outdoors Today! NO NEED TO CHOOSE FUNCTION OVER STYLE because we've had a great time working on the details of this hand-forged, iron hook to make it sleek, stylish, and strong. The long, arching body offers a classy, traditional look. The clever tip is curved upward and pressed to provide a secure location for your adornments. BIGGER IS BETTER. This large hook extends 14 inches from where you attach it to the hook's tip. Hook height reaches 11 inches from the bottom of the backplate to the top of the curve. SO EASY TO INSTALL. Simply use the three high-strength, coated, black screws that are included with your hook to attach it to a deck, fence, post, wall, or tree. The horizontal cross plate makes it easy to level and provides extra support and strength. 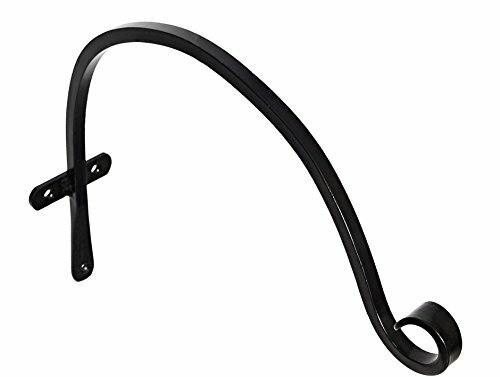 The black-powder, rust resistant coating provides your hook protection from the elements in your backyard, patio, or garden while enhancing its durability and appearance for years to come. MULTIPURPOSE. Some of the great uses we have come up with for this hook (some might call it a really big bracket) are: hanging wind chimes, wind spinners, lights, lanterns, bird feeders, bird houses, flower pots, and planters. The possibilities are (almost) endless! YOU ARE A REAL PERSON, and we will make sure you feel like one. We know it's hard to build trust online, so we'll only provide you with the best products and service around, or your money back! If you have any questions about this product by UpBlend Outdoors, contact us by completing and submitting the form below. If you are looking for a specif part number, please include it with your message.